Gillian Vine considers going up instead of out. Stacked buckets in a Dunedin Garden. Going up in the garden used to mean roses or clematis working their way up big trees or - as with runner beans - grown on frames or trellises in the vegetable garden. That approach is still relevant in larger gardens but may need a bit of a rethink for smaller plots. This season, in my tiny Dunedin garden, I grew Scarlet Runner beans in a pot, hammered some plastic trellis on to the back fence and positioned the container so the beans could climb. It worked a treat. A climbing Rampicante courgette is also heading upwards, taking up much less space than the bush types. When there seemed to be nowhere for gooseberry cuttings from a bush that was more that 1m wide, an article in an English magazine saved the day. It recommended espaliering and I decided to give it a whirl. Not only did it use less space but the berries were much easier to pick and the pruning was less work. At home, there are lots of ways to save space or cover ugly structures and I admire the efforts of a Dunedin couple who have used coloured buckets as planters, stacking them so they take up little room and are an eye-catching highlight. The green wall at the Calyx in Sydney's Royal Botanic Gardens is the largest in the Southern Hemisphere. However, the majority of impressive decorative vertical plantings I have seen have been commercial ones. Among the best is at Sydney's Royal Botanic Gardens, where a large wall in the Calyx is used for ongoing horticultural displays. This is the largest green wall in the southern hemisphere and mixes indoor and outdoor areas, with exhibits changing at least once a year. At ground level, there are themed displays and happily, this is free. It is pleasing to see airports around the world embracing the concept to give weary passengers something green to look at instead of miles of grey or cream walls. Because the displays are vertical, there's nothing to bang into or fall over, so these wall displays are not going to trip the wobbliest traveller. The living wall in Harvest Court, George St, Dunedin. Through the Keep Dunedin Beautiful scheme, Momona could surely follow the example of places such as Hanoi and Singapore, giving local meaning to clean and green. The commercial walls are often complex, with pots of plants slotted into special frames that hold them in place. They need regular watering and checking so dying plants can be replaced. That is the down side, for it means they are quite high-maintenance, although modern watering systems help. A decorative feature at Hanoi's Noi Bai International Airport. 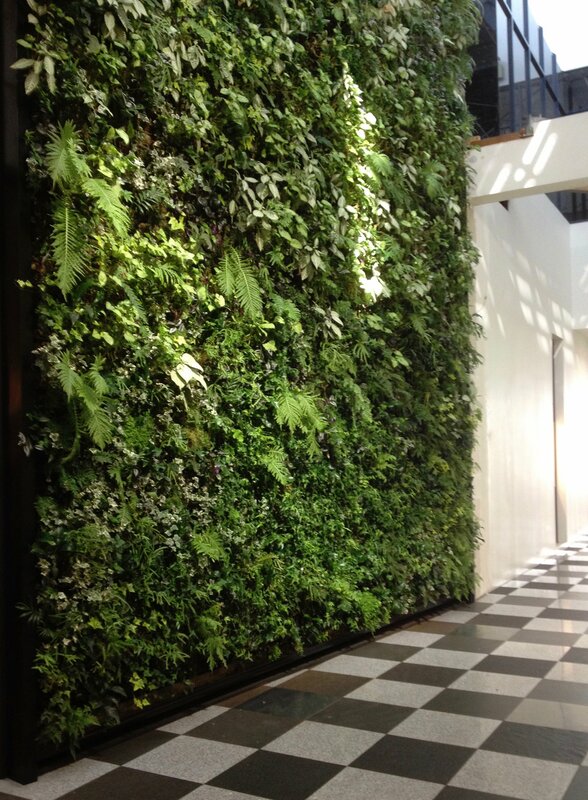 For Dunedin examples of vertical planting, pop into Harvest Court Mall or stroll Jetty St pedestrian area and look for the green wall near the concrete sheep. In different ways, each shows how attractive a wall garden can be. At home, plants in containers can be put into boxes fixed to walls. These work well for spring bulbs that can be replaced after flowering with trailing nemesia, petunias, bacopa, nasturtiums and even tomatoes, while perennial herbs such as thymes and rosemary can make permanent displays. Look around and decide whether up, not out, is the way to go.